It was in 1998, on Roseanne Barr's syndicated talk show. Trump complimented Moore's "Roger & Me," a takedown of General Motors and its then-CEO, Roger Smith. "It's terrific," he said, then added he hoped never to be a similar target. Everybody laughed. Well, 20 years later, Moore has done that Trump film, and he includes that strange little scene. Only Moore isn't laughing much now, and the current president probably isn't either — especially if he's heard about the Adolf Hitler comparisons. But "Fahrenheit 11/9" — its title a sly reference to both the day after the election and Moore's hugely successful "Fahrenheit 9/11" — is about a lot more than one man. In fact, little time is devoted to Trump's performance or policies; presumably, Moore knows he's preaching to the choir. What he seeks to examine are the root conditions — social, cultural, political — that got us here. Or, to use Moore's own words, minus one we can't print: "How the f--- did this happen?" He spends two full hours trying to answer that question. Is it effective? That depends on whether you accept the implicit argument that you can't truly illustrate our messy, chaotic, disjointed times without, well, a messy, chaotic, disjointed movie. He sort of has a point. And whether Moore's frenetic but absorbing work here — the cinematic equivalent of a Jackson Pollock painting, where you throw everything and some of it sticks — pleases or frustrates you, one thing is clear. Moore's at his best when hitting a subject dear to his heart. 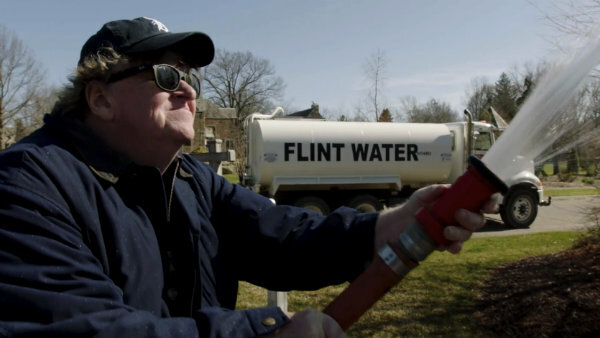 That's why "Fahrenheit 11/9" is best when Moore turns his camera on his hometown of Flint, Michigan, and its devastating water crisis. You may not cry when Moore unleashes a "Jaws"-like score as Trump takes the presidential oath. But you may cry when listening to the grieving, angry citizens of Flint. Then it's on to the big question. HOW? Yes, it was the Russians, Moore says, and James Comey, but really, it was Gwen Stefani. When Trump realized NBC was paying her more on "The Voice" than he was getting on "The Apprentice," Moore posits, he announced a "fake" presidential run to raise his profile with the network. Only later, he says, adoring rally crowds convinced Trump that maybe this president thing was an OK idea. Moore excoriates the media. The candidate was their cash cow, he says, showing none other than Les Moonves — the recently deposed CBS chief — saying, "It may not be good for America, but it's darned good for CBS." So how do we get to Flint? Well, Moore tells us that Trump loves dictators — North Korea's Kim Jong Un, for one — and that brings him to Rick Snyder, the Michigan governor, to whom Moore attributes dictatorial tendencies. He blames Snyder for the crisis in which lead-tainted water was pumped from the Flint River into homes and businesses, leading to elevated lead levels in children's blood. Using his familiar ambush technique, Moore tries to make "a citizen's arrest" at Snyder's office, then tries to get an aide to drink a glass of Flint water. He fails at both. More surprising is Moore's criticism of a prominent visitor to Flint: then-President Barack Obama. He shows perplexed Flint citizens reacting to a moment when Obama, whose visit was eagerly anticipated, appears tone-deaf to the depth of their concerns. It's part of a broader criticism Moore is making of the Democratic establishment, which he says has been too willing to compromise, shifting the party to the right in defiance of popular will. Congressional leaders like Nancy Pelosi and Chuck Schumer come in for harsh treatment. Moore also argues that support for Bernie Sanders was suppressed. So, who is going to help save the nation? Moore argues that it's first-time candidates, many of them women, like New York's Alexandria Ocasio-Cortez, or striking teachers in West Virginia, unifying to win key concessions. And it's student activists in Parkland, Florida. Moore's focus on gun violence in schools recalls, of course, his searing 2002 film "Bowling for Columbine." He joins a student meeting to show how they are rejecting politics as usual, confronting state lawmakers, organizing marches, even forcing out a Maine candidate who called student Emma Gonzalez a "skinhead lesbian." Finally, Moore makes his most attention-getting argument. He juxtaposes audio from a Trump rally with video of Hitler speaking. Moore has said he's not arguing equivalency here, just that one must consider history as a lesson in how some leaders manipulate public fear. "It's the world in which we live," Ferencz says, echoing Moore. "We've got to change it or perish." "Fahrenheit 11/9," a Briarcliff Entertainment release, is rated R by the Motion Picture Association of America "for language and some disturbing material/images." Running time: 125 minutes. Two and a half stars out of four. Oscar-winning filmmaker Michael Moore won't be around for a Michigan film festival that he founded but the show will go on.